The Escalade 8506 series is 3ware’s second generation Serial ATA ( SATA ) RAID controller. Building from it’s previous generation, this series offers a 64 bit 66MHz PCI interface. On paper that’s about the only improvement over the 8500 series, but benchmarks and deep digging reveal otherwise. The Escalade 7506 and 8506 series are 64 bit 66 MHz upgrades to their 7500 and 8500 series 64 bit 33 MHz predecessors. Check out our previous coverage of the Escalade 7500-8, and our extensive definitions of ATA RAID. Serial ATA has really taken off the last year, mostly due to Intel adding native support in it’s 865 and 875 chipsets. Instead of worrying about master and slave settings, each SATA drive has it’s own connection via a slim cable. No jumper worries, small connectors and a slim long cable meant lots of new opportunities for system integrators. Manufacturers scrambled to create SATA products, including ATA RAID controller manufacturers 3ware, Promise, LSI Logic and Highpoint. A simple and easily employed solution was available from Marvell: the 88i8030 Serial ATA Bridge Chip. This translates Parallel ATA to Serial ATA and vice versa. Maxtor and Western Digital use them on their SATA hard drives, and the ATA RAID manufacturers mentioned above use them on their controllers. Take an existing product, add the Marvell 88i8030 and you’re in the SATA business. For ATA RAID manufacturers this makes a lot of sense, since they can design a solution for Parallel ATA, then use the Marvell 88i8030 and have a Serial ATA solution. Which brings us to the 3ware Escalade 8506-8. The XOR engine is the 3ware 200-0069-00 in the centre. The ATA controller chips are the same as the previous generation, the 200-0033-00, which can control four drives each. This time around two ISSI memory modules are onboard, maintaining 3ware’s pattern of 1.8 MB hardwired cache. The board layout is clean and relatively compact. The spots for the 12 port model can be seen on the PCB, saving 3ware some manufacturing costs. 3ware has two technologies for ATA RAID: StorSwitch and TwinStor. Here’s a quote from their FAQ, which is pretty self explanatory. 3ware’s StorSwitch replaces shared-bus architectures found in SCSI systems with a dedicated port for each drive, thus maximizing throughput and minimizing latency of the drive subsystem. 3ware’s TwinStor is a RAID level 1 technology that profiles disk drives and optimizes the algorithms for greater performance during reading and writing in a two-disk mirror. TwinStor is designed for applications that are read intensive, such as web serving which utilizes a mixture of small and large data sets with multimedia content. Opening the box showed the controller, installation guide, software on 3.5” floppy disk and CD-ROM and eight SATA cables. Everything you need, except possibly SATA power adapters. They will run you a few dollars each, but may not be needed if your SATA hard drives also have molex power connections such as the Maxtor drives used for our testing. I installed the controller, connected the drives and powered up the system. The BIOS setup hasn’t changed from the previous 7500 series, and for that matter doesn’t stray far from any ATA RAID controller. Select your drives and define your array. For RAID 0, 1 and 10 arrays the build time is instant. For RAID 5 arrays you now have a choice of having the array initialized, meaning the entire array is written to for verification, or you can go the instant route. Once into Windows 2000 the driver prompts were followed and the system was up and running after a reboot. The 3ware Disk Management ( 3DM ) was installed: it’s HTML based and can be accessed from anywhere on your network. A very clean and easy to follow interface, it’s quite easy to use. We were fully installed and away to the races. Lots of nice management features, including email and pager notification. SMART status is displayed as well. When something goes wrong a message flashes on screen to alert the user, as I experienced when one of my drives went into power saving mode all on it’s own. Let’s talk features. 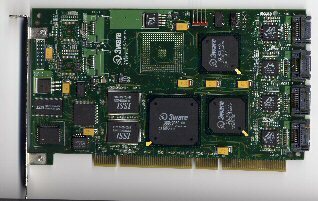 The Escalade 8506 is a 64 bit 66 MHz PCI controller capable of sending 512 MB per second across the PCI bus. It handles RAID levels 0, 1, 10, 5 and JBOD ( just a bunch of disks ). Who really spends $500 for JBOD? It supports hot swap and hot spare. Hot swap allows you to remove a failed drive and replace it while the system is running, provided you’re using a drive enclosure. I love drive enclosures but could never spend the money on them: crazy stuff. Hot spare allows you to have an extra drive connected to the controller, not part of the array, that can be added if a drive fails. Both scenarios have the controller rebuilding the array after a drive replacement in real time, so you lose performance but not uptime. All in all every ATA RAID controller should have these features, and most do. Benchmarking was performed and compared against the Promise FastTrak S150 SX4. While the previous PATA benchmarks showed 3ware with a sizable lead, this time around things are evenly matched. The 8506-8 took most of the benchmarks, but by a very slim margin. 3ware trumps in two areas: 8 and 12 port cards, and a smaller form factor. Otherwise it’s a dead heat. The 3ware Escalade 8506-8 is an excellent SATA RAID controller, capable of handling eight drives. If your needs lean to eight or twelve drives, 3ware is the way to go. Editors note: this review was migrated from the old eBabble.net site and the photos updated. Originally published November 28th 2003.